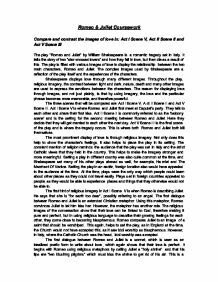 Romeo & Juliet Coursework Compare and contrast the images of love in: Act I Scene V, Act II Scene II and Act V Scene III The play "Romeo and Juliet" by William Shakespeare is a romantic tragedy set in Italy. It tells the story of two "star-crossed lovers" and how they fall in love, but then die as a result of this. The play is filled with various images of love to display the relationship between the two main characters, Romeo and Juliet. The complex images used by Shakespeare are a reflection of the play itself and the experiences of the characters. Shakespeare displays love through many different images. Throughout the play, religious imagery, the contrast between light and dark, nature, death and many other images are used to express the emotions between the characters. The reason for displaying love through images, and not just plainly, is that by using imagery, the love and the particular phrase becomes more memorable, and therefore powerful. The three scenes that will be compared are: Act I Scene V, Act II Scene II and Act V Scene III. Act I Scene V is where Romeo and Juliet first meet at Capulet's party. They talk to each other and share their first kiss. Act II Scene II is commonly referred to as the 'balcony scene' and is the setting for the second meeting between Romeo and Juliet. Here they decide that they will get married to each other the next day. Act V Scene III is the final scene of the play and is where the tragedy occurs. This is where both Romeo and Juliet both kill themselves. The most prominent display of love is through religious imagery. Not only does this help to show the character's feelings, it also helps to place the play in its setting. The constant mention of religion reminds the audience that the play was set in Italy and the strict Catholic views that they held in the country. ...read more. This would have a lot of an effect on the audience, as they would be able to see the comparison of their everyday life, and something exotic, which is what Romeo is describing Juliet as. In Act II Scene II, the images of light and dark continue. Romeo starts by saying "it is the east and Juliet is the sun". This metaphor is the base for many more images that are used throughout the rest of the scene. Romeo then says "Arise, fair sun, and kill the envious moon." This personified image not only links to the previous image, but it is also more powerful than the last due to the contrast between the sun and the moon, opposites. As there was no electricity at the time, light from the sun, moon and stars was much more important than it is now, therefore making this imagery more powerful and relevant at the time. Next, Romeo builds up a large image of Juliet's eyes and compares them to the sky. "Two of the fairest stars in all the heaven, having some business, do entreat her eyes to twinkle in their spheres till they return." Here Romeo is saying that two of the brightest stars had to go away, and they asked Juliet's eyes to take their place. He then extends this by saying "What if her eyes were there, they in her head? The brightness of her cheek would shame those stars, as daylight doth a lamp." Here Romeo is wondering what it would be like if her eyes were in the sky and the stars were in her head. He says that the brightness from her cheeks would outshine the stars the way the sun outshines a lamp. He extends this image one more time by saying "Her eye in heaven would through the airy region stream so bright that birds would sing and think it were not night." ...read more. This, along with the previous quote, is a contrast to the original sea imagery. This expresses the change of tone within the play, as when they are both happy, and first in love, the sea imagery is positive. But when the tone of the play has changed, and Romeo is distraught about the death of Juliet, the sea imagery becomes negative. In Act II Scene II, Juliet compares Romeo to a rose. She says "That we call a rose by any other word would smell as sweet." She says that even if Romeo was called something else, like a rose, he would be just as sweet. Later on in the scene, Juliet foreshadows the ending of the play. She says to Romeo "This bud of love, by summer's ripening breath, may prove a beauteous flower when next we meet." She says that the love between her and Romeo is still in its early stages and she hopes by the next time that they meet, it will be like a beautiful; flower. However, the next stage after a beautiful flower is that it withers and dies. This is exactly what happens to them, their love blossoms like a flower, but then dies with their death. Throughout the play, Shakespeare cleverly used certain images to outline the mood of the play at a particular point. He has used images primarily from religion, nature, light and darkness to express the love between Romeo and Juliet. By using images from the same themes, he helps the audience to link and connect the separate scenes. The use of recurring themes and images helped to reinforce the powerful emotions and love between Romeo and Juliet. As the tone changes throughout the play, so do the images and they become darker and start to foreshadow death more and more. The use of these images helps the audience to visualise and understand the depth and intensity of the characters' emotions. Shakespeare has cleverly used images from particular themes to express to the audience the powerful but doomed love of Romeo and Juliet. ?? ?? ?? ?? ...read more. This is a very careful, thorough piece of work. The writer has gone to great trouble to identify every incidence of love imagery in these three scenes and to examine their effect on the audience, especially in the historical and social context of the time the play was first performed. The phasing from lightness to darkness is well noted, though a little laboured. Sentence construction is well controlled, though some quotations are slightly inaccurate and there are occasional faults in punctuation. The style can be a bit plodding, with over-explanation sometimes. There is a tendency to split up related material into too many paragraphs. 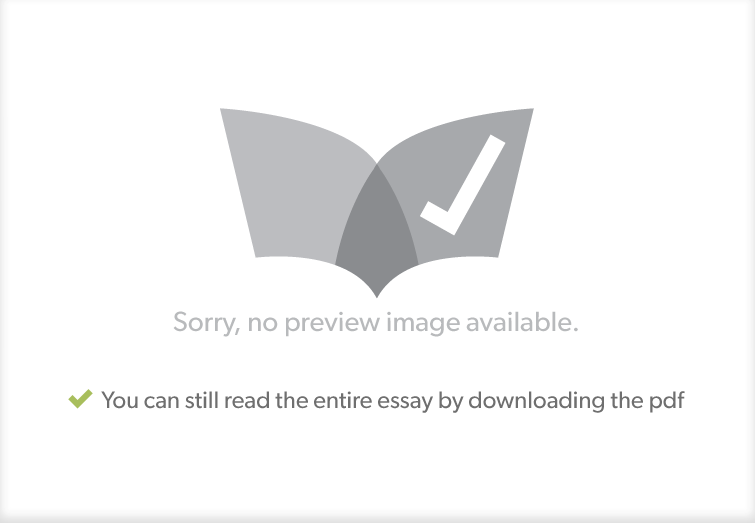 However, overall this is a competent essay. The Nurse is clearly shown here to be going against Juliet's parents' will, and that she is betraying them. If the Nurse perhaps didn't tell them, then we would see the two lovers being found together by Lady Capulet. The Nurse uses formal language when talking about Juliet's mother ('lady mother'). that he is "fortune's fool" by having contributed to his own downfall. In Act V, scene i, Romeo demonstrates his belief in the power of dreams to foretell the future once again when he believes that he will be reunited with Juliet on the basis of another dream. "Delay this marriage for a month, a week, Or if you do not, make the bridal bed In that dim monument where Tybalt lies"- which reveal that the love between Romeo and Juliet is so strong that anything that may come between them, like marriage, is worse than death. We just click, we can talk to each other with ease. I know it is true love, when I go near him my heart goes wild and a strange sensation comes over me and I cannot bear to be away from him, even if he is a Montague. O most wicked fiend! Is it more sin to wish me thus foresworn-" She has been let down by her Nurse, the only person whom she could really rely upon. Without any reassurance or support, Juliet is left to curse her only aid in her love bound situation. Moreover, Shakespeare presents Romeo's character as a passionate man and a man obsessed with lust through using passionate words like 'torches, burn, bright'. The audience can also see that Romeo's love for Rosaline is quickly forgotten, Romeo says: "Did my heart love till now?"